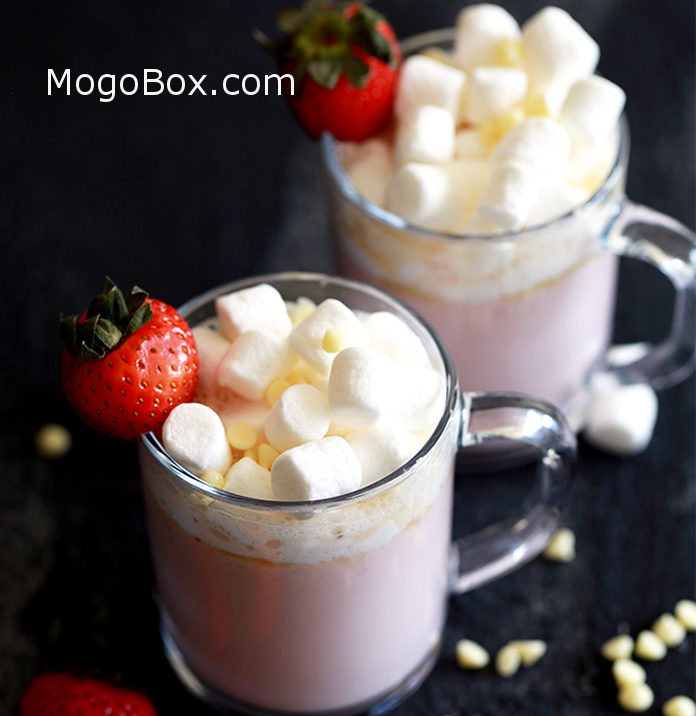 MogoBlog MogoLicious Tasty Tip of the Day: Strawberry milk, cream, sugar, white chocolate chips and frozen strawberries are blended together to create this velvety Slow Cooker Strawberry Hot Chocolate that can not only be made ahead of time, but can also serve a crowd. Top each mug with a mountain of marshmallows, more white chocolate and garnish with a fresh strawberry and you’ve got yourself a mug of hot chocolate that’s sure to be a hit with anyone lucky enough to have a sip. In a six quart slow cooker, whisk together strawberry milk, heavy cream and sugar. Heat on LOW for 6 hours, whisking hot chocolate every hour to ensure chocolate chips are melting into the hot chocolate instead of burning on the bottom of the slow cooker. Add strawberries to blender carafe along with 1 cup of hot chocolate mixture. Blend until smooth and pour mixture back into slow cooker. Whisk to combine. Fill mug with hot chocolate and garnish marshmallows, additional white chocolate chips and a strawberry. This entry was posted in MogoBlog, MogoLicious and tagged Chocolate Chips, Crockpot, Heavy Cream, Hot Chocolate, Slow Cooker, Strawberries, Strawberry Milk, Sugar, White Chocolate Chips.